The Waking Jungle wallpaper has been designed with passion to become the ultimate jungle style wallpaper. Sophisticated and intricate, every tiny element you see has been hand painted to give the wallpaper design a unique look. Welcome to your very own tropical rainforest. You can now create the most lavish tropical themed feature wall or room decor that will become the talking point of your friends and family for months. Is This Wallpaper For Me? Weeks of photographing and editing followed, chopping and changing every element of the design. To make all of the individual pieces interweave and fit together perfectly. The Waking Jungle wallpaper has layers upon layers of rich greenery. At first, you may spot a monkey or leopard. But as your look closer, you will encounter colourful birds, a chameleon, exotic flowers and even a tiny frog! 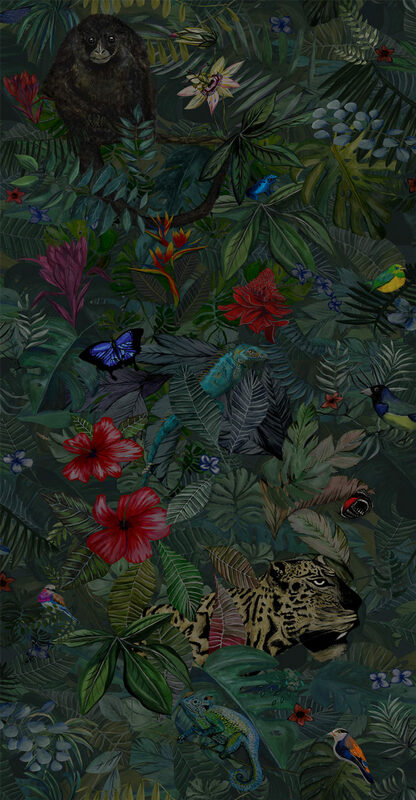 This tropical rainforest wallpaper has all the rich green colours you could ever want. With subtle additions of blue and yellow leaves to make it even more unique. Overall, the colour of this wallpaper is tropical green with a rich dark ambience for an exuberant and sensual interior look. The animals and flowers are bright, adding little bursts of colour to the wallpaper. Blue, yellow, red, pink, orange and more, they all work in harmony together without overpowering the design. Our Jungle wallpaper is hand painted and therefore has lots of unique details when you look closely. Like brush strokes and layers upon layers of different leaves. If you’re in pursuit of an Instagram worthy, dream decor house, you will probably be trying to find unique products that you absolutely fall in love with. Ones that are not mass produced and that have lots of tiny extra noticeable details! This jungle wallpaper has been designed for you. To create your stunning feature wall, to liven up your hallway or to bring an exciting and exotic theme to your bedroom. You will never get bored of it on your wall and notice something new each time you look at it!